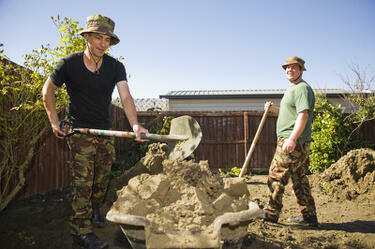 Private Alex Crivellaro from the Auckland Territorial Unit clearing silt from a resident's garden in east Christchurch. 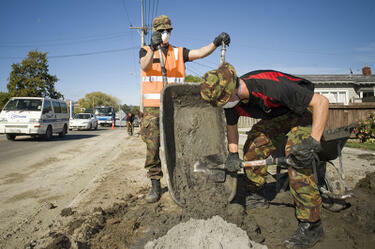 Two members of the Auckland and Northland Territorial Units clearing silt from a house in east Christchurch. 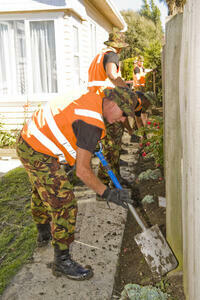 Members of the central and lower North Island Territorial Forces clearing silt from a resident's garden in Christchurch. 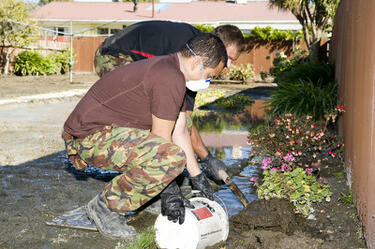 A member of the Territorial Forces Unit clearing silt from a house in east Christchurch. 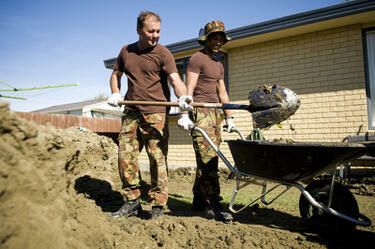 Two members of the central and lower North Island Territorial Forces clearing silt from a resident's garden in Christchurch. On the left is Sapper Nelson Lambert from Palmerston North. 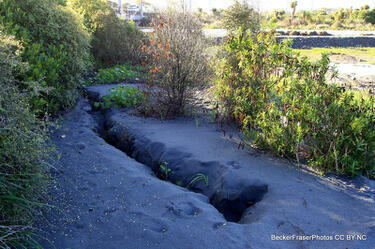 Photograph captioned by BeckerFraserPhotos, "Anzac Drive close to the Avon River showing the liquefaction and ground tearing". An image from a Army News March 2011 article titled, "Territorial Force". 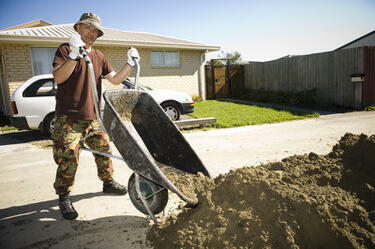 The image shows a member of the Territorial Force clearing silt from a resident's garden in east Christchurch. An image from a Army News March 2011 article titled, "Territorial Force". 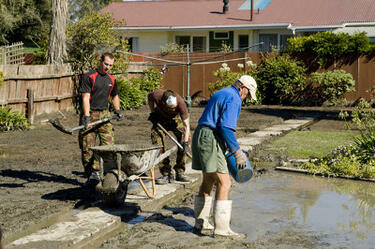 The image shows members of the Auckland and Northland Territorial Units clearing silt from a resident's garden in east Christchurch. The resident is out in the garden helping out. An image from a Army News March 2011 article titled, "Territorial Force". 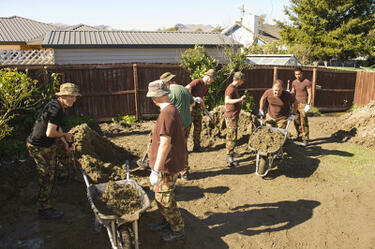 The image shows members of the Central and Lower North Island Territorial Units clearing silt from a resident's garden in east Christchurch. On the left is Private Quentin Chat of Taranaki, and Corporal Samuel Hatcher of Wellington is on the right. 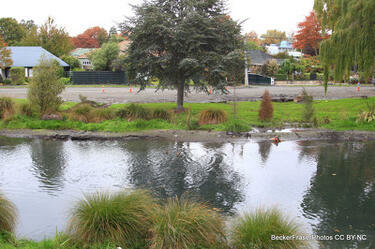 A view over the Avon River towards Oxford Terrace where the road is badly cracked and slumping towards the river. Road cones mark the uneven surface. 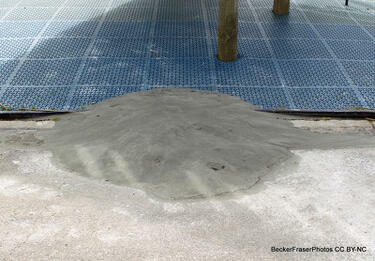 A sand volcano in the Halswell Primary School grounds near the playground. Sand volcanoes were caused by liquefaction where the soil loses its strength during the earthquake and the silt rises upwards, ejecting out of a hole like magma in a volcano. 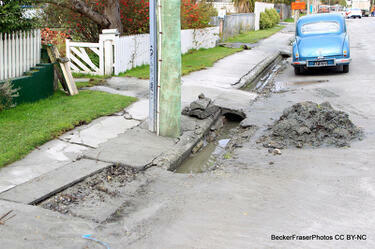 Photograph captioned by BeckerFraserPhotos, "Showing the depth of the ejected sand during liquefaction - Armagh Street". 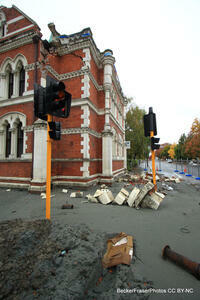 Extensive damage caused by liquefaction in Bracken Street, Avonside. 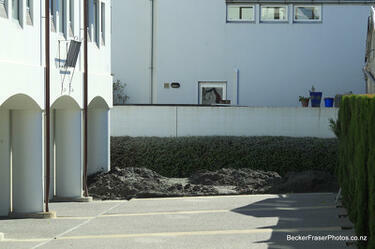 A pile of liquefaction can be seen in front of this house. 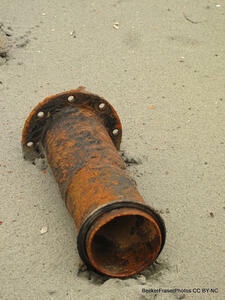 After the earthquake, many people had to dig this silt out of their properties and place it on the road to be collected. 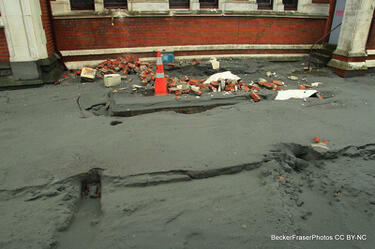 A pile of liquefaction in the car park of a row of apartments on Armagh Street. 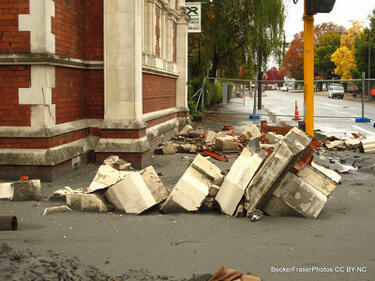 Building rubble and liquefaction on the footpath outside the former Public Library on the corner of Hereford Street and Cambridge Terrace. A pipe from the outside the former Public Library on the corner of Hereford Street and Cambridge Terrace. 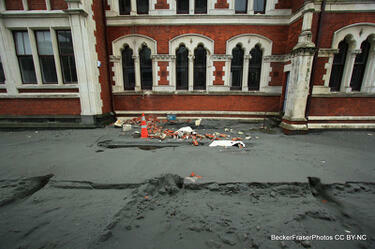 Photograph captioned by BeckerFraserPhotos, "The former Public Library and extensive liquefaction, Hereford Street". 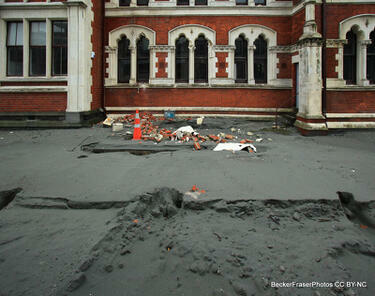 Liquefaction and building rubble on the damaged footpath outside the former Public Library.